Laptop vs. Desktop Computer – read before buying A New Computer! Tuesday, April 29th, 2008 | Computers | Comments Off on Laptop vs. Desktop Computer – read before buying A New Computer! With my father considering a new computer purchase, he will soon have to decide if he wants a new laptop or another desktop. The popularity of laptop computers continues to grow. Although the differences between laptops and desktops have narrowed over the years, going portable involves many trade offs. Is going mobile worth it? 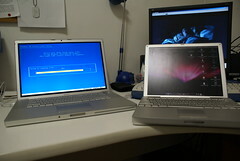 The goal of the laptop is mobile computing. They are frequently called portable, mobile, or notebook systems. Laptops are powered by a rechargeable battery. The monitor is either a standard size or widescreen LCD. Keyboards allow for easy input. Mouse control is typically provided by a trackpad. Also contained within the device are the typical computer components such as a CPU, video card, and hard drive. In a laptop everything is included in one package. Getting “under the hood” and changing components can range from hard to impossible. Although the desktop largely contains the same components, the parts are not as integrated. Any beginner can change the keyboard or monitor of a desktop; however, the same beginner would find that changing those components on a laptop near impossible. In contrast, a desktop is not portable either. Desktops and laptops are very different beasts. Price. Based on similar specifications, a laptop can cost over twice as much as a desktop. For the same money, you will always be able to get a much more powerful desktop with a larger screen and more storage. A desktop is always going to give you more for your money. Power. Many high end desktops contain components that are not available in laptops. Some of the video cards out now are almost as big as some entire portable systems. Power requires cores and chips. Power requires cooling. Power requires wattage. Large desktop systems have plenty of room for big components, big power supplies, and redundant cooling. Power dependent task such as editing and rendering video will proceed less painfully on a desktop beast. A laptop is always going to settle for smaller, more efficient hardware. Many laptops that were sold as “Windows Vista Compatible” were not able to run Vista with all features enabled. Because it is purchased with less reserve, a laptop will not provide as many years of productivity before seeming underpowered and dated. Screen size. We are in the world of ever growing LCDs. A 30 inch LCD computer screen is beautiful. If you have a desktop, you can even have multiple monitors. Many laptops start at 13 inches and the largest is 19-20 inches. If you go with a laptop over a desktop, sacrifice of screen real estate is the norm. External monitors can easily be connected to a laptop; however, there is the obvious loss of portability. Wireless Network Required. With a desktop system ethernet works well. Having a notebook that is tethered by cat-5 cable makes no sense at all. To enjoy using a notebook system, a wireless network and internet is really required. Wireless networking is getting easier but is nowhere as easy as just plugging in a cable. Using and securing a wireless network requires learning a whole new set of computer skills. Toughness. Laptops get dropped, banged, and generally mistreated. A desktop stays at home in general safety. My son broke the “e” key off one of my laptops after my daughter took it up to her room. He knows not to bang on my desktop but a laptop in his sister’s room was too inviting to pass up. Upgrading / Fixing. Another hard drive can be added to most desktops easily, and changing out a keyboard or monitor is trivial. Upgrading or fixing a laptop frequently requires a trip to the shop. Desktops can frequently be given new life with a newer, more powerful video card. As video is integrated in a laptop, this upgrade is not possible. The difficulty in upgrading is another reason that a laptop will not provide as many years of productivity when compared to a desktop. The strength of a laptop is its mobility. It is the trump card that can overwhelm any of the desktop’s advantages. The cheapest, most powerful desktop in the world does not help the student that needs a computer in class. Chilling at a coffee shop with a mocha and your lappie can be magic. Recording or making music at a club or friend’s house is easy on a laptop. Getting work done or watching a movie on a plane can make the time fly. Can you really put a value on checking email from the potty? Although portability is amazing, it is frequently not required or utilized. I know three of my neighbors that have their notebook sitting on the exact same place on their desk day after day. They are never mobile with their mobile computers. Many people really think they will take their computer everywhere, but then they never do. Desktop worshippers will die arguing the strengths of the desktop that I have described; however, none of them are really deal breakers if portability is required. A laptop will always be more expensive and underpowered compared to the desktop. The careful consumer, however, can purchase a powerful laptop that will run non-gaming applications perfectly. (The majority of games will run on a laptop system too, but occasionally the video may not be as impressive.) A 15 to 17 inch laptop screen is plenty for most users. The integration of wireless networking into the major operating systems is making wifi easier as well. Industrial strength laptops that can tolerate the toughest of conditions are available for the clumsiest of us. If mobility is required, these are trade offs that can be comfortably tolerated. A desktop is always going to provide the biggest bang for the buck. Users rendering high definition video files or playing the latest games will naturally gravitate toward the powerful desktop systems. Users that must have mobility will require a laptop. The rest of us will have to decide if the convenience of portability is worth sacrificing the strength of the desktop.